OKLAHOMA CITY – The first Unleash The Beast cut of 2019 is coming following the conclusion of the Express Ranches Invitational in Oklahoma City. The fifth event of the season is the final guaranteed event for riders that finished between 31-35 in the 2018 world standings. It is also the final event where alternates for UTB events are based off 2018 and 2019 world points earned. Beginning with the Mason Lowe Memorial in St. Louis, five draw spots and any alternate positions will be filled for Unleash The Beast events based on the 2019 world standings. The 2018 Top 30 riders are guaranteed eight UTB events before being subject to the cutline and relegation to the Pendleton Whisky Velocity Tour. No. 32 Silvano Alves (No. 7 in 2019 world standings), No. 34 Alisson de Souza (No. 10 in 2019) and No. 35 Cody Jesus (No. 13 in 2019) are in good position to maintain their UTB spots as of now, even if they have to qualify as a top alternate because of injuries to other riders. Alves would also have World Champion exemptions at his disposal. There are two riders from last year’s 31-35 ranking that are flirting dangerously with the cutline. No. 31 Tanner Byrne is currently No. 62 in the world standings, but he will have one more exemption for St. Louis because he was unable to compete in Glendale, Arizona, two weeks ago due to travel issues. However, No. 33 Sean Willingham has his back against the wall heading into Oklahoma City. Willingham is currently 35th in the world standings, but there are 19 riders ahead of him in the standings that are currently not seeded on the UTB. The 37-year-old, though, has been riding well of late with two qualified rides in two of the past three events. Willingham has drawn Sun Country (0-0, UTB) for Round 1 on Friday night. Willingham is roughly 200 points out of a top alternate spot. Fans can watch the action exclusively on RidePass beginning at 7:30 p.m. ET. The race to become one of the top alternate riders for the sixth UTB event is going to be fierce. There are currently 19 riders ranked in the Top 35 that did not finish in last year’s Top 30, and there are two Pendleton Whisky Velocity Tour events taking place this weekend in Grand Rapids, Michigan, and Knoxville, Tennessee. No. 6 Rubens Barbosa, No. 8 Lucas Divino, No. 11 Danilo Carlos Sobrinho, No. 14 Cannon Cravens, No. 19 Ezekiel Mitchell, No. 27 Juan Carlos Contreras, No. 34 Emilio Resende, No. 52 Paulo Lima, No. 81 Lonnie West and No. 85 Cody Heffernan. Heffernan is set to make his 2019 season debut after winning the 2018 Australian Bushmen's Campdraft and Rodeo Association bull riding championship and ABCRA Finals last week in Australia. The 29-year-old has drawn Modified Hou (0-0, UTB). Fellow Team Australia rider Lachlan Richardson is also making his season debut. Richardson has missed the first month of the season because of an ankle injury he sustained at the 2018 PBR Canada Finals in November. Richardson takes on 027 Concealed Carry (2-2, UTB) in Round 1. Cravens will square off against 2018 Co-PBR Bull of the Finals Hocus Pocus (2-0, UTB) in Round 1. 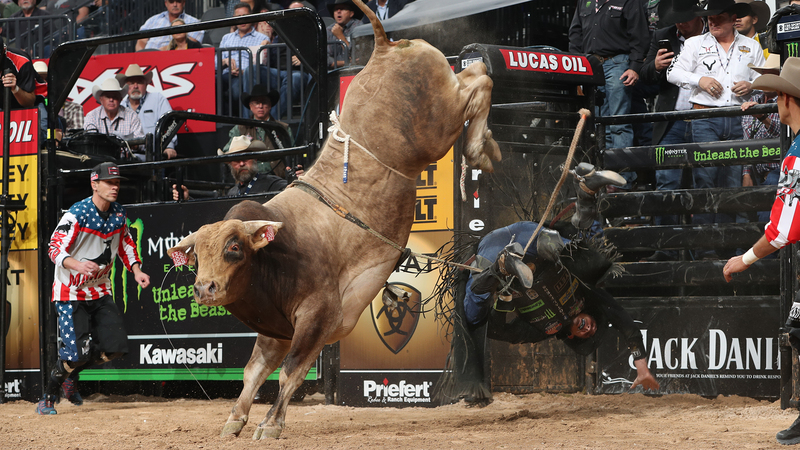 Hocus Pocus was marked 44 points at the Fort Worth, Texas, ABBI event earlier this month for bucking off Leonardo Lima in 3.23 seconds. There are 10 riders not competing in Oklahoma City – reigning World Champion Kaique Pacheco (left knee), 2016 World Champion Cooper Davis (concussion), Fabiano Vieira (left shoulder), Nathan Burtenshaw (right collarbone), Matt Triplett (right wrist), Dener Barbosa (reconstructive shoulder surgery), Marco Eguchi (right elbow, left knee), Claudio Montanha Jr. (suspension), Guilherme Marchi (retirement) and Valdiron de Oliveira (retirement). Montanha was suspended by the PBR’s competition committee for his actions during the Sacramento Invitational championship round. Montanha was disqualified for excessive time (chute clock) inside the bucking chute. According to the PBR competition department, the committee ruled that Montanha did not make an honest attempt to get out of the chute aboard After Midnight. Injuries will play a determining factor in how many draw spots will be open come St. Louis, but as of this weekend, there will likely be at least eight spots open in St. Louis because of the retirements of Gulherme Marchi and Valdiron de Oliveira and injuries to Nathan Burtenshaw (collarbone surgery) and Dener Barbosa (shoulder surgery). Two-time World Champion J.B. Mauney expects to compete in Oklahoma City with a broken leg and will square off against Little Tucker (0-2, UTB). Mauney was bucked off Wednesday night at the Fort Worth Stock Show & Rodeo. He is set to ride again at Will Rogers Coliseum Thursday evening. World No. 4 Chase Outlaw confirmed on Thursday morning that X-rays on his neck showed no fracture after Lifting Lives bucked him off in 6.86 seconds at the Sacramento Invitational. Outlaw trails world leader Jess Lockwood by 1,047.5 points. Outlaw has drawn Audacious (0-0, UTB) and Lockwood takes on Yatesy Down Under (0-0, UTB). There are three invites this weekend in Oklahoma City – Ruger Piva (Velocity Tour), three-time Indian National Finals Rodeo champion Dakota Louis (Native American invite) and Esteban Bustamante Salcido (Hispanic invite). Piva is the No. 17 bull rider in the world standings and is in OKC courtesy of his victory at the Velocity Tour event in Reno, Nevada. The 23-year-old is a two-time Idaho state wrestling champion (152 pounds) and won 101 consecutive matches. He eventually walked on to Boise State before transferring to Montana Western, where he won a National Collegiate Wrestling Association national championship at 165 pounds. The Challis, Idaho, native also split the New Town, North Dakota, Touring Pro Division win with Outlaw this past November. Piva is 8-for-13 at all levels of competition. He makes his premier series debut against Sniper (0-0, UTB). Louis and Salcido are competing at next weekend’s 2019 WinStar World Casino & Resort Global Cup USA in Arlington, Texas, for the Team USA Wolves and Team Mexico, respectively.